Summer camp 2012, held at Pam Rigby’s fantastic venue New Barn Livery, got off to a flying start this year. Although we’d all arrived armed to the teeth with waterproofs and rainsheets, we were soon discarding our coats for T-shirts and sun screen as the sun beat down. 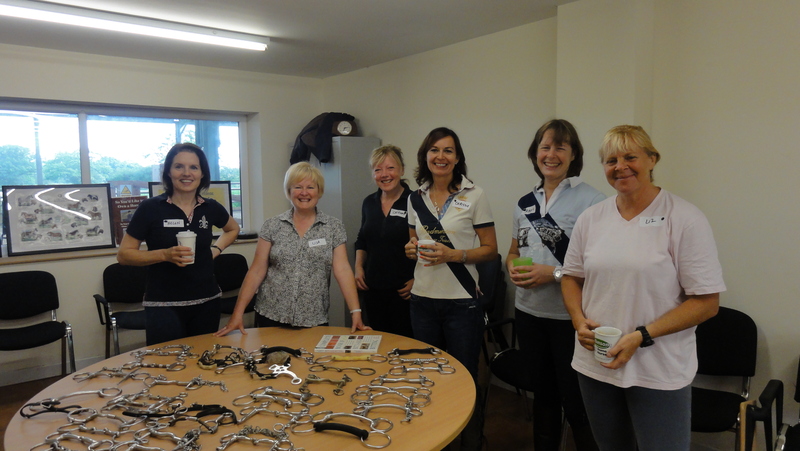 The twelve riders were quickly divided into two groups, and Ride 1 went off to practice drill riding with Pam, while Ride 2 headed into the classroom for a session on ‘bits and bitting’, with Lisa Pritchard of The Modern Horse. The ‘Ride 2’ riders. Left to right: Helen, Lisa, Catrina, Chrissie, Tracey and Liz. I was (wisely) behind the camera. Lisa started off her talk by recommending Elwyn Hartley Edwards’ Complete Book of Bits and Bitting. “In my opinion, the definitive work on the subject,” she added. “I believe that many commercial bits on the market today don’t really do anything,” she continued. 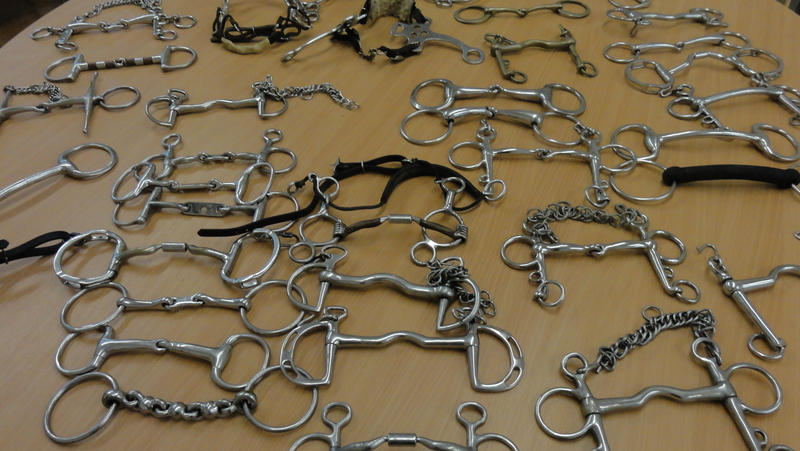 “For example, bits fall into three broad categories – snaffle, Pelham and gag, the snaffle being designed to raise the horse’s head while the Pelham being designed to lower it. In order to be work efficiently, a gag bit should have fixed rings, as loose rings will cause the bit to slide under pressure rather than produce the required action. A small selection from Lisa’s collection. Always remember to take the conformation of your horse’s mouth into consideration when decided on a bit. Contrary to popular belief, a thick, vulcanite mouthpiece is not always a kind choice, as it’s not suitable for horses with fleshy tongues. The horse may appear to be working correctly as it’s foaming nicely at the mouth, but in fact the pressure of the bit on its tongue is causing it to over-salivate, as it can’t swallow its saliva properly. Very thick mouthpieces are more suitable for horses with thin bars or tongues, as they have more room in their mouths. Lisa then went on to look at individual bits. This bit incorporates moving cylinders of copper with the stainless steel mouthpiece. It’s great for young horses, as it encourages them to mouth and play with the bit, and also helps prevent a horse with a tendency to boring from taking hold of the bit. Lisa’s cherry roller has D-rings, as the straight edges give extra support for a young horse. The long side bars of the Fulmer snaffle work in a similar way, giving a very clear ‘push’ signal whenever the rider uses the rein. This helps keep the horse straight. The Pelham is a combination of the two bits of a double bridle, Bradoon and Weymouth. It shouldn’t be used with Pelham roundings, as these blur the action of the bit and make it less efficient. When used correctly with two reins, using the snaffle rein only will produce the same effect as a hanging cheek snaffle. Using the curb rein only simulates the action of a Dutch gag. The Pelham should always be used with a snug, correctly-fitted curb chain, with no more than one finger’s width between the chain and the horse’s jaw. Pelhams incorporating a jointed or French link mouthpiece are actually useless, as the bit becomes too flexible and loses its curb action. Jointed Pelhams have a snaffle action only. 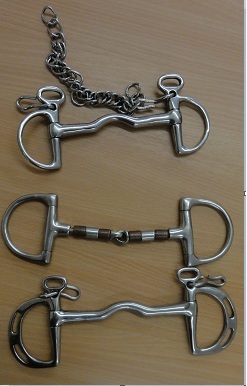 Kimblewicks have a ported mouthpiece, curb chains and D-shaped rings, and are curb bits designed for use with one rein. They’re available with slots in the rings, and this type of bit mimics the action of a curb as the rein is moved from slot to slot. If used without a curb chain, this bit will have a snaffle action only. The English hackamore is perhaps the best known form of bitless bridle, and consists of padded sheepskin noseband, a curb strap, and two long metal shanks. When the rider uses the reins, it produces an exaggerated level action, and puts pressure on the nose, jaw and poll. Some horses go very well in hackamores, but they can be very severe if used carelessly. Myler are American bits. They have a thin, flexible mouthpiece with barrels rather than links which make the bit sit nicely in the horse’s mouth. with copper bands to encourage salivation, and come in many different variations. The Myler combination bit is a fairly mild bit, as it acts on the nose first then the mouth, giving the horse warning of a rider’s intentions.